China’s first domestically designed and built carrier, the Type 001A, has reportedly begun its fourth sea trial ahead of its anticipated April commissioning. These trials will test its aviation system for the first time. While no official announcement of the trials have been made, a Thursday statement by the Maritime Safety Administration of China noted that the Bohai Strait and parts of the Yellow Sea have been closed to sea traffic between December 28 and January 4. At the same time, multiple photos and videos show the 70,000-ton, 1,033 foot-long ship putting to sea from its home port of Dalian on Thursday. ​"During this sea trial, the carrier's aviation division will be coordinated for the first time," Wang Yunfei, a naval expert and retired PLA Navy officer, told the Global Times Thursday about the reported tests. He noted the ships would also be running tests on the radar, communication, air traffic control systems, along with its takeoff and landing equipment. The South China Morning Post referenced online photos Thursday showing three blast deflectors on Type 001A's flight deck, further indicating flight ops were likely. The devices are used to deflect jet exhaust in order to avoid injury, damage and general chaos. The carrier's air wing comprises Shenyang J-15s, a cousin of the Sukhoi Su-33 designed and built by China for its own uses. Like the Su-33, the J-15 is built for carrier ops. The Type 001A also carries many helicopters. Although the Type 001A is an indigenously designed ship, it's heavily based on the People's Liberation Army Navy's first carrier, the Liaoning, which was built by the Soviet Union as the Kuznetsov-class carrier Varyag. Ukraine subsequently sold the unfinished ship to Beijing, which refitted it for testing and study. The Type 001A, a full-service carrier, is the ultimate fruit of that endeavor. 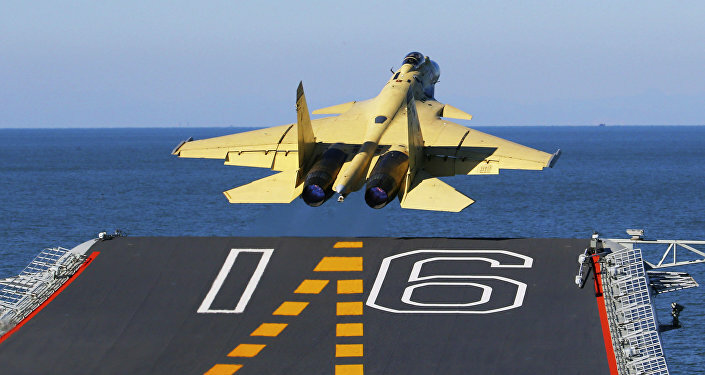 Like Liaoning, the Type 001A utilizes a ski jump to launch aircraft from its flight deck, as opposed to the steam catapult method favored by the United States' carriers. Fully loaded, it can carry 32 J-15s, eight more than the Liaoning. However, the newer ship's radar and bridge systems are much more advanced, Sputnik reported. Wei Dongxu, a Beijing-based military analyst, told the Global Times that while Type 001A's flight tests should be easy due to the ship's similarity to the Liaoning, crews would likely be using full-sized models of aircraft while testing loading and maintenance equipment and not real J-15s, of which the PLA-N doesn't even have enough to fill both carriers' hangars, Sputnik reported. The carrier has conducted three past sea trials in May, August and October, and is expected by experts to enter service in time for the 70th anniversary of the foundation of the Chinese navy in May, SMCP reported. Justice Dept. Claims Chinese Hackers Stole Data From US Navy, NASA, Energy Dept.